Why does my sink fill up when I run the dishwasher? Of all the plumbing problems a homeowner can have, a sink full of water isn’t the worst thing that can happen, but it is definitely an inconvenience. 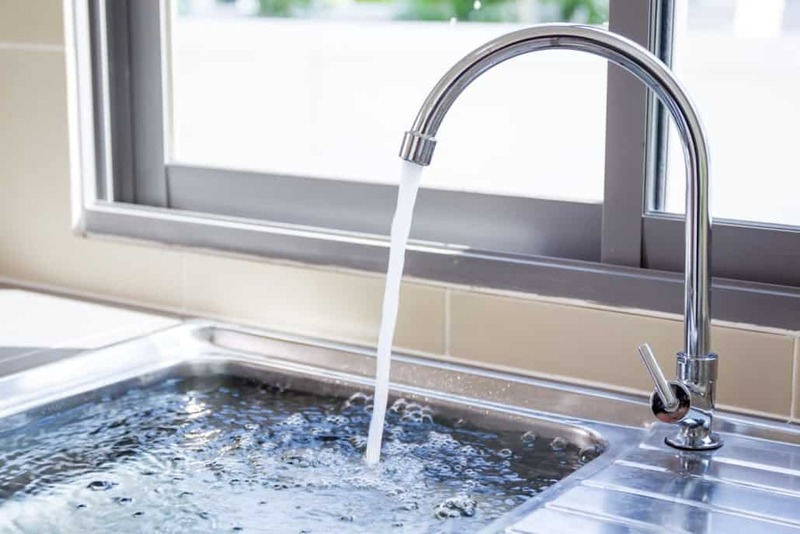 There are a variety of things that can cause this, but today we will be discussing how your sink can be filled up when running the dishwasher. Luckily enough, this common problem can usually be resolved with occasional maintenance or a cleaning. Here is how you can fix and prevent your sink from filling up while doing your dishes! The first step in attacking the problem is unplugging all the relevant appliances (i.e. the dishwasher, the garbage disposal, etc.). This helps keep accidents and injuries for happening via electrocution. Then you’ll shut off both the hot and cold water off to prevent any water flow into your appliances. When this problem arises in your kitchen, it is important to note that both your sink and dishwasher actually flow out the same drain line. If this drain line has incurred any overflow or backup is going to cause that sink overflow. Clogs can occur in any four of the following places: the dishwasher, the sink, the air gap, or the garbage disposal. Here’s how to approach each of these clogs. Your drain plug can be a huge factor in whether or not water is draining properly from the sink or dishwasher. This plug covers the hole where the disposal connects to the dishwasher and can result in improper drainage. This is usually a factor when the garbage disposal is new and can easily be fixed by removing the drain plug. It is always a possibility that a clog in your sink is what is causing the bad dishwasher drainage. Try running the garbage disposal first. This will just ensure that no food or backup prevents the waterflow. If that doesn’t work, try using a sink cleaner. You can purchase a brand name sink cleaner in order to break down buildup within the drain. The last option would be to sink the drain. If neither the garbage disposal or sink cleaners work, you’ll need to bring in the big stuff. Sink snakes can be purchased from any local hardware store and can often do a great job of removing the backup. However, if none of these options work, you will be best off calling a plumber. When there is a small amount of water in the bottom of your dishwasher it is usually nothing to be concerned about, however, if the dishwasher has its own pool of standing water, you might have a problem. Before going into depth on the issues, always check to see of the drain at the back of the dishwasher is obstructed. You can also check the drain hose to make sure it isn’t kinked or causing blockages. It is also important to check the brand and amount of soap you’re putting into it when washing. When using the wrong ones, you can cause buildup over time rather than having it always run smoothly. If you currently have an air gap installed, the source of your problem can also be coming from there. An air gap is used as a backflow prevention device and is located on top of the sink next to your faucet. If your air gap seems to also be spilling water, you’re most likely experiencing blockage within the device. To ensure your air gap works properly, all you need to do is remove the cover and unscrew the cap to look inside. If the debris is noticeable, you may be able to remove it really easily. If the buildup looks pretty prominent, you might require a more serious tool like a bottle brush to remove the problems. When it comes to your kitchen plumbing, regular maintenance is very important. Ensuring you are clog and overflow free is going to save you a lot of trouble in the long run. A great tip regarding this is to not treat your garbage disposal as if it is a trash can. You can read more about what is and isn’t garbage disposal approved here . If you’re experiencing problems with the dishwasher overflowing into the sink and don’t know what to do, please give ProFlo a call at (951) 694-1300. 8 Not-so-Lucky HVAC noises Why does my furnace fan keep running?